Cleveland paper defends publishing details about Tamir Rice’s parents' criminal background. 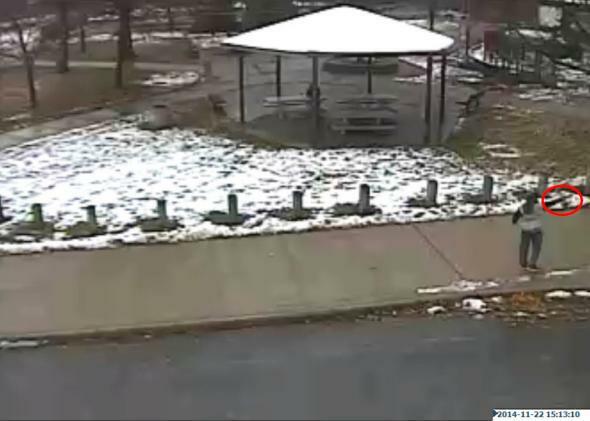 Tamir E. Rice, 12, is seen allegedly pointing a pellet gun at the Cudell Recreation Center in Cleveland, Ohio, in this still image from video released by the Cleveland Police Department. Rice was shot by a patrol officer on Saturday after a 911 call reported someone pointing a gun at people. We’ve seen this type of media coverage before, though it’s often focused on the victims of police violence themselves, rather than on their relatives. After the deaths of Trayvon Martin in 2012 and Michael Brown in August, for example, some news stories evidently sought to paint the slain teenagers as drug addicts, delinquents and thugs. This coverage was criticized by many as an attempt to smear the victims’ characters and distract from the issue of police violence—and, more subtly, to suggest that the killing of young black men is somehow acceptable or unsurprising. And it succeeded—these stories were used by some people to explain why Martin and Brown deserved to die, or how they may have somehow invited their own deaths. Who are the “people from across the region” asking that question? More importantly, how is it relevant to Tamir Rice’s death? It isn’t. It simply isn’t. And adding a paragraph after-the-fact to try to justify your actions is borderline insulting. But the editors appear to be standing by the story. Chris Quinn, the Northeast Ohio Media Group’s vice president of content wrote a piece defending the line of inquiry: “One way to stop police from killing any more 12-year-olds might be to understand the forces that lead children to undertake behavior that could put them in the sights of police guns.” Knowing details about the child’s background “can shed further light on why this 12-year-old was waving a weapon around a public park.” That weapon in question was a toy gun.